In 2012, the federal guidance required states to develop healthcare coalitions. 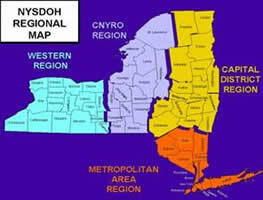 NYSDOH Office of Health Emergency Preparedness (OHEP) introduced a revised structure reducing the 8 RRC regions to 4 coalition areas. The 4 Health Emergency Preparedness Coalitions (HEPC) are led by the NYSDOH Regional Office Director. The core focus of these HEPCs is on integrating and coordinating Emergency Support Function (ESF)-8 activities as they apply to healthcare and public health emergency planning and response. The 8 RRCs were renamed Regional Training Centers (RTC) with a revised mission to focus on workforce training needs. In 2014, the national HPP funding was drastically reduced. As a result, NYSDOH OHEP made the decision to reduced the number of funded RTCs through a competitive RFP process. Three agencies (URMC, AMC & SBUH) were selected to provide training to the HEPC regions during the time period of July 2014 - June 2017. In July 2017, SUNY Upstate received an award. Stony Brook University Hospital: Metropolitan Area HEPC Region (Long Island & Mid-Hudson). This website is maintained by the URMC - Finger Lakes Regional Training Center to support the HEPCs.